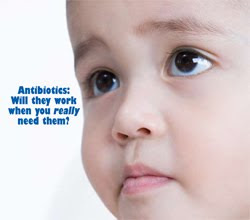 Every year, the CDC sponsors a week-long observance called Get Smart About Antibiotics Week, intended to bring attention to this issue of antibiotic misuse that all of us here are so concerned about, and to link the efforts of federal and state agencies, nonprofit groups, and anyone else with an interest. Today marks the start of the 2009 week, and of course it comes as a crucial time: With the H1N1 flu pandemic causing so many people to seek care for upper respiratory illnesses, the possibility of antibiotics being misprescribed for a viral illness is greater than usual. The homepage for the CDC campaign is here. There is an abundant list of materials, images, campaign strategies and suggestions for framing the conversation, along with graphics (I've lifted the one at left from a poster aimed at parents of young children), PSA sound files, and cute little web widgets such as the image at right above (sorry for the poor layout skills, it's a busy morning). Since this comes from the CDC and is therefore taxpayer-funded, all of it is open-access. So go, already.